John Houston Stockton (born March 26, 1962 in Spokane, Washington). 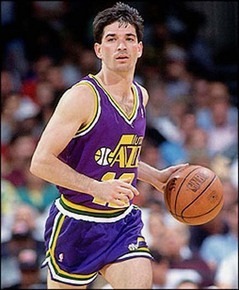 John Stockton was drafted by the Utah Jazz at 1984 (no.16 overall) and played for them till the end of his basketball career. When I say he played I mean really played, this guy was, amongst other things, one of the iron-men of the league as he missed only 22 games throughout his career (played 1504 out of 1526). Imagine that in his last season (41 years old) he started at all of the 82 games that Jazz played that season. Stockton remained loyal to the Jazz and spend his entire career there. Why not? Himself and his buddy Karl Malone created one of the best dynamic duos in the history of the NBA and led Utah to two NBA Finals and three more times to the Western Conference Finals throughout the 90s. It is a pity though that this great team never won a championship (you probably guessed right, they played against the Bulls). He may never won a championship but he recorder some pretty impressive numbers and he was always considered one of the best players in the league, even though some of his critics believed that he wouldn’t be able to achieve all that if it wasn’t for Malone. Anyway, there are always some people that criticize and that’s all that they do. I believe that Stockton’s individual ability was unique, he could make all of his teammates better. His teaming with Karl Malone benefited them both and probably Malone was the luckiest one. I cannot imagine any big guy in the game basketball that wouldn’t want to play alongside John Stockton. This short white guy that didn’t look like a basketball player and definitely an NBA superstar, is the all-time NBA leader in assists (15806) and steals (3265). He also holds the record for assists per game over a single season with 14.5 in 1989-90. Stockton led the NBA in assists per game 9 consecutive times (1987-88 to 1995-96) throughout his career and 7 of them was during the 90s. They could have been ten but in 1996-97 season he came second. He also led the league in steals per game two times (1988-89, 1991-92) and was named an all-star 10 times, 9 of them in a row (1989-1997) and one time in 2000 (in 5 of them he has been voted as a starter by the fans). He has also been named co-MVP, alongside his teammate Karl Malone, in the 1993 NBA all-star game that held in Utah. Additionally, he has been named in the All-NBA first team 2 times (1993-94 and 1994-95), 6 times in all-NBA second team (3 of them during the 90s) and 3 more times in the All-NBA third team (all 3 of them in the 90s). As a great defender, that he was, he has been named in the second all-defensive team 5 times (4 of them in the 90s). Stockton made a lot of great performances throughout his career but I had to pick one, I would pick the last game (game 6) of the Western Conference Finals in 1997 against a great Houston Rockets team (Olajuwon, Barkley and Drexler). At that game Stockton played 38 minutes, scored 25 points and gave 13 assists. 9 out of his 25 points came at the end of the fourth quarter, in fact it was the last 9 points of the game that the whole Jazz team scored. So, at the end of that game the score was tied at 100-100 and John Stockton had his version of ‘the shot’ (although the original version came next year and in irony was against Stockton’s team) in the final seconds of the game, hit a three-pointer and Jazz qualified (4-2) for their first ever NBA Finals appearance. The rest of the story is the same for every team that faced the Bulls in an NBA Finals series at the 90s (lost 4-2 in 1997 and lost again 4-2 in 1998 even with home-court advantage this time). The NBA, the fans and the coaches showed their respect, recognition and appreciation on Stockton’s abilities and achievements many times, as he has also been selected to play for the original ‘Dream Team’ in 1992 Olympic Games held in Barcelona and in ‘Dream Team III’ that played in 1996 Olympic Games held in Coca-Cola city (Atlanta). Furthermore, he has been named as one of the 50 Greatest Players in NBA history and has recently inducted to the Naismith Hall of Fame (2009). For all the above reasons I believe that John Stockton was the best point guard that played during the 90s. He is the best play maker I have ever seen since 1989 that I follow the league. I believe that he is for sure one of the best that ever played the game and he deserved an NBA title, but that is another thing because there are a lot of great players that never won a title and this doesn’t make them less great but it certainly stigmatizes their careers. Gary Dwayne Payton (born July 23, 1968 in Oakland, California). Drafted by the Seattle Supersonics (some of you have not even seen this team play and its same. I do not have something with Oklahoma team but I believe that everyone that has seen the Sonics, wants them back) at no.2 of 1990 NBA Draft. Gary Payton show just a little of his abilities during his first two NBA seasons and many believed that he was overrated, shouldn’t be a number two overall draft, will never play at a high level and so on, so forth. But they were wrong he was determined to prove his worth and based on his mad defensive skills, his anticipation and smart play, led the Sonics and developed as one of the dominating point guards of the 90s. I was one of those guys that didn’t give enough credit to Payton’s abilities and style of play. He was not a spectacular player by himself and his style of play was a beat unorthodox for my preferences. It was not just me though, everyone of us that loved basketball whenever we talked about the Sonics we were always admiring and discussing the achievements and dunks of the other half of the Sonics’ team core, Shawn Kemp. This situation occurred until the 1995-96 season where most of us understood that the reason we loved the Sonics was Gary Payton because it was his ability that made that team so exceptional and took the best of Shawn Kemp. 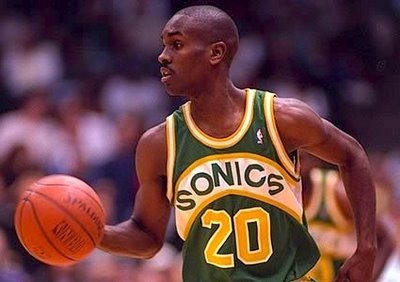 Gary Payton and the Sonics was one the best teams of the 90s but they only reached the Finals once (1996). They had a great run in 1993 where they finally got defeated by the Phoenix Suns, after a superb series (4-3), in Western Conference Finals. This blog will definitely present the Sonics’ team of the 90s. In 1996, this was the year of the Bull in the NBA astrology, Michael Jordan has returned from his short retirement (although it seemed to us like a century) and the Bulls recorded NBA all-time best 72-10 during regular season. Everybody was talking about the Bulls and all the eyes were on Chicago, Gary Payton’s Sonics were at the same season recording a franchise best with 64-18. The Sonics finally reached the finals, but it was impossible to run away from destiny. The destiny for the best teams from the west during the 90s had the name Chicago Bulls. Sonics lost 4-2 and Gary Payton never reached the finals again during the 90s. As it was expected, Gary Payton was guarding Michael Jordan throughout the Finals. To be more accurate at the beginning of the series Payton was guarding Pippen but at the second half of the series it was ‘the glove’ trying to catch the ‘air’. He was the most difficult opponent that MJ faced in a Finals series, as he actually held him to 27.3ppg. It is important to mention that Bill Walton, commentating for NBC at the time, said Payton “outplayed” Jordan during the second half of the series. “(In Game 4, Jordan had his) lowest output in a Finals game, much of it with Payton guarding him. Though afterwards, Jordan refused to give Payton credit, saying ‘No one can stop me, I can only stop myself. I missed some easy shots.’ The truth is, Jordan finds the NBA’s Defensive Player of the Year (Payton) annoying. He views the (young Payton) as impudent, and he would love to have a big game at (Payton’s) expense.” (NBA on NBC Preview, Game 5). Payton and George Karl did a great job on MJ but unfortunately, for them (and myself, as I was supporting the Sonics in this matchup), it was not enough. In 1996 he was selected as a replacement for Glen Robinson for the Dream Team III roster (if you ask me, he should have been the initial choice and not a replacement). ‘The Glove’ was also known for his trash talking ability, (those that play the game of basketball understand the importance of trash talking in affecting opponent’s psycology and game in general). This characteristic of his resulted in many suspensions, fines and technical fouls but this never bothered him, it was a part of his personality an innate ability. Kevin Maurice Johnson (born March 4, 1966 in Sacramento, California). KJ was my favourite point guard of the 90s era. In my view he was the prototype for the point guards that we now watch in the league. Players whose height is less than 1.90cm (almost 6-2) and dunk the ball in any possible way, score more than 20ppg. and run the game as well. That type of player was Kevin Johnson, those of us that had the opportunity to watch him play will never forget the unbelievable dunk on Hakeem Olajuwon (I am sure that neither Hakeem will ever forget). 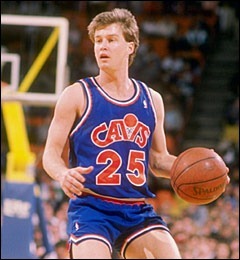 Kevin Johnson has been drafted by the Cleveland Cavaliers at number 7 of the 1987 NBA Draft where he played as a reserve of, no.7 of this list, Mark Price. Of course KJ came from the bench for the Cavs for less than four months as he was traded to the Phoenix Suns at the trade deadline date of the same season (25 February 1988). He played for the Suns for the rest of his career and he was always a starter and their franchise player. From the moment he joined the Suns he was lucky enough to team up with some other notable players. During the first season of the decade (1989-90) himself alongside with Tom Chambers, Jeff Hornacek, Eddie Johnson and Mark West led the Suns to the Western Conference Finals where they lost 4-2 to the Portland Trail Blazers. At that same year he made his first all-star appearance, as a reserve for West, and he was named in the second all-NBA team. Next year he was a starter for the West all-stars and had one more appearance in all-star game in 1991-92 season. He has been named in second all-NBA team four times in total (three of them during the 90s) and one time in the third all-NBA team. Kevin Johnson is one of only two players in NBA history (Magic Johnson is the other) to have twice averaged at least 20.0 points and 10.0 assists per game over the course of a season while shooting at least .500 from the field. His other accomplishments are equally astonishing as his team was the only one that has defeated Magic Johnson’s Lakers and John Stockton’s Jazz in the same post season, in 1990 and he is the Suns all-time leader in assists, free throws made and attempted. He was too good and he made his teammates better, he was spectacular and a joy to watch but his team was lacking something in order to make the next step and reach the Finals. That was a player with a character and a winner attitude as a hunger to win it all. This player was Charles Barkley, that came to Phoenix on 1992 and made a great impact. The Suns finally reached the NBA Finals where, as usual for the Western Conference winners, lost to the Chicago Bulls 4-2. KJ played again exceptionally well and even tried to guard the ‘best of the best’ during that series. In Game 3 of that series KJ played 62 minutes in a triple-overtime thriller, which is a record for minutes played in a play-offs game. Kevin Johnson said about that game that “without a doubt it was the most physically and mentally draining game I’ve ever been a part of. Everyone on the team played with passion and energy, and we pulled out a win in perhaps one of the greatest games in NBA Finals history”. There is an incident that happened that season which, I will never forget and I guess KJ will probably remembers that now and laughs, although it was not that funny when it actually happened. Charles Barkley, after nailing a game-winning shot to beat the Blazers 115-114 in the third to last game of the regular season, jumped on his teammate Kevin Johnson to celebrate. The thing was that Barkley outweighed KJ by about 70 pounds and wound up injuring Johnson’s knee. KJ missed the final two games of the regular season and the playoff opener against the Lakers (a game they lost). That was the only trip that KJ took to the NBA Finals but the injuries never let him alone, he faced many more injuries serious and not that led him to retire on 1999 and made a short comeback for the 2000 play-offs. I really liked they way Johnson was playing the game and I believe that he inspired many young talents of his era. 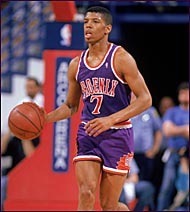 I also loved his Converse shoes, (Kevin Johnson Converse React Juice) as a kid. Timothy Duane Hardaway (born September 1, 1966 in Chicago, Illinois). 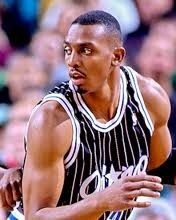 At number 4 of the top ten point guards for the 90s I have chosen “Mr. Crossover”, Tim Hardaway. Tim, was selected by the Golden State Warriors at number 14 of the 1989 NBA draft. Hardaway with Chris Mullin and Mitch Richmond formed the “run TMC” of the Golden State Warriors at the beginning of the 90s which was a real joy to watch. This Hardaway of the 90s was a real point guard, a player known for his ability to crossover his opponents with inconceivable quickness and his ability to score. Those two abilities of him were so exceptional, amongst the point guards of his era, that his even great ability to run the offence for the team that he was playing was always overlooked. Haradaway, was named an all-star five times, 3 consecutive for the West (1991-1993) and two consecutive for the East (1997-1998) but started only once, at 1997 for the East. He started his career at the Golden State Warriors where he played from 1989-90 season until 1995-96 (22 of February 1996) when he was traded to the Miami Heat and those were the two teams that he played during the 90s. While he was playing for the Warriors he has also been selected as a member of “Dream Team II” that won the World Championship in Canada at 1994. He was always ranking amongst the top ten in assists, throughout the 90s and he has been named in All-NBA first team once (1996-97), three times in All-NBA second team (1991*92, 1997-98, 1998-99) and once in All-NBA third team (1992-93). He was also a member of the All-Rookie team at 1989-90 season. Hardaway belongs in a special group of players as he is one of only seven players in NBA history that averaged more than 20ppg. and 10apg. in a single season. In fact Hardaway achieved it twice in his career 23.4ppg. and 10.0apg. in 1991-92 season and 21.5ppg. and 10.6apg in 1992-93 season, both times as a Warrior. He had very good seasons with the Warriors but they have only reached as far as the second round of the Western Conference Play-offs. When he went to Miami he teamed up with Alonzo Mourning, Jamal Masburn, Dan Majerle and coach Pat Riley. At their best season (1996-97) they recorder 61-21, 3rd best in the NBA and 2nd in Eastern Conference, but they were unlucky because although they reached the Eastern Conference Finals they had to overcome the Chicago Bulls. This was impossible (lost 4-1) and this was the closest that Tim Hardaway ever got to an NBA title. 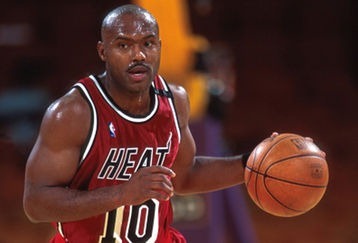 I have always liked the way Tim Hardaway was playing the game of basketball, the way he dribbled was unique and many of us were trying to replicate his game and learn how to dribble the ball by watching him play. I believe that players like Tim Hardaway revolutionized the game, he brought something of his to the game and moved the whole game forward. The killer crossover is now a move possessed by the majority of the good point guards of the NBA but even now the way that he was doing it remains unique. 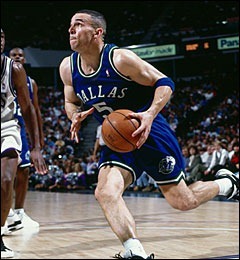 Jason Kidd was a second overall draft pick by the Dallas Mavericks at 1994 and at the same season he was named co-rookie of the year alongside Grant Hill. He led the league in triple-doubles and helped the Mavs become the most improved team of the year by recording 36 wins and 46 losses, but bear in mind that the year before the Mavericks had the worst NBA record with 13-69. Some of you, probably the younger ones, may think that it is unfair to rank Jason Kidd at number 6. If you do, I will have to remind you that this is his ranking for the 90s where I believe and according to his performance during that period, that there were better point guards than Jason Kidd, . During the 90s Kidd was always at the top-ten in assists and steals per game and he led the league in assists per game in 1998-99 season with 10.8 ast.. He was a starter for the West all-stars in 1996 and a reserve in 1998. He was a member of the all-rookie team in 1994-95 season and he was voted as a member of the All-NBA first team at 1998-99 and NBA’s All-defensive team the same season. Jason Kidd made it clear from his first season, with his game, that he was going to make have an impact on the game of basketball. He played for the Mavericks from 1994 to 1996 where he was traded to the Phoenix Suns and played alongside another great point guard of his era, Kevin Johnson. When I think of Jason Kidd and his performances during the 90s I always have that bitter taste because I always bring back the memories of that Mavericks team and how bad it was. Kidd was never one of my favourite players, of the 90s era, but his ability to create for his teammates, the way he ran the game, his vision and especially his all-around abilities made him unique and I always respected him. * Jason Kidd is still an active player and the above career stats are representing his statistical performance until the 9th of February 2011.